If you’re looking for a strong, secure door lock, the Schlage brand is a top choice. Beyond high-quality deadbolts and door handles, Schlage also produces keyless and electronic locks with extra security features. Schlage has even moved into the home automation realm with some smart locks that can be accessed from your smartphone. Schlage’s top-quality door locks consistently rank in our lists of best digital door locks and best smart door locks. Keep reading to see reviews of some of our favorite Schlage locks and an at-a-glance comparison so you can decide which style is right for your home. The Schlage Sense Smart Deadbolt can be locked and unlocked with your phone, the touchscreen keypad on the door, or a traditional key. The Schlage Sense pairs with your smartphone via Bluetooth and includes a free app (available for iOS and Android) for access. The biggest selling point for the Schlage Sense is that it is compatible with Apple HomeKit so you can ask Siri to lock the door for you or create home automation scenes with other compatible products (for example, a smart lightbulb could turn on when the door is unlocked). If you have an Apple TV within the door’s range, you can use it as a Wi-Fi adapter so you have remote access all the time. (Alternatively, you can purchase a Schlage Sense Wi-Fi adapter on Amazon.) The Schlage Sense is the only smart door lock currently compatible with Apple HomeKit, so if you are creating a HomeKit setup, this is the lock to get. Aside from the smart features, the Schlage Sense replaces your deadbolt with a Grade 1 lock for maximum security. It also comes with a built-in alarm that beeps whenever the door is opened or closed (great for keeping track of who is coming and going during the day) and a loud alarm when a forced entry is detected. One of the few drawbacks to this lock is that the piece on the inside of the door is quite large—three by eight inches and about two inches deep. The bottom line is that the Schlage Sense gives you all the security of a Schlage deadbolt and all the smart features you’d want, especially for Apple HomeKit users. 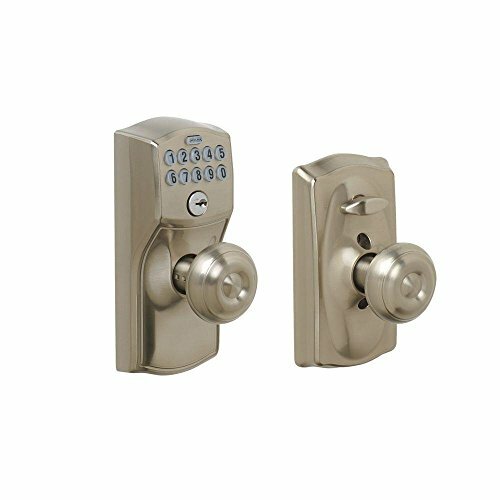 Check out our best smart locks article to see how the Schlage Sense stacks up against other smart door locks. Front dimensions: 3 x 5 x 1 in. Back dimensions: 3 x 8 x 2 in. The Schlage Connect Touchscreen Deadbolt, one of our top keyless door lock picks, is similar to the Schlage Sense but with one big difference: where the Sense connects to your phone over Bluetooth or Wi-Fi, the Connect uses Z-Wave to link to other home automation products. As such, the Schlage Connect integrates with many home automation platforms and alarm systems, including Amazon Alexa, Samsung SmartThings, Iris, and Wink. The Connect does not have its own app, but once it’s connected to a Z-Wave hub in your home, you can control the lock through the hub’s app. While you can program the lock and add access codes without a smartphone, it is difficult to do, so we recommend this lock if you can integrate it with your other Z-Wave smart home appliances. 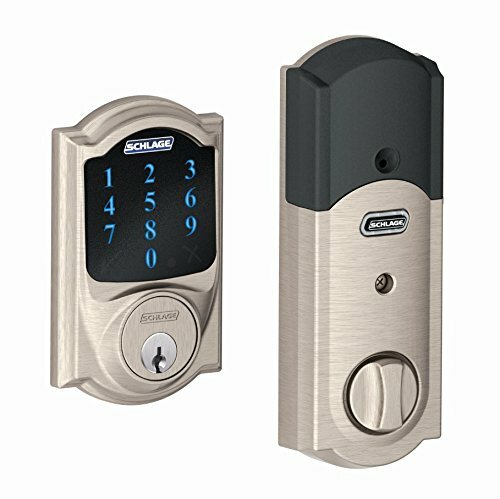 Like the Schlage Sense, the Schlage Connect comes with a Grade 1 deadbolt replacement, the highest rating a lock can receive. It also has a built-in alarm with three sensitivity settings: a quiet beep for regular activity, a loud alarm for tampering, and a siren for forced entry. The touchscreen keypad is also fingerprint resistant, so no one will be able to tell which numbers you press most often. Overall, the Schlage Connect is an incredibly secure lock and the right one for anyone building a smart home without Apple HomeKit. Check out our article here to see how the Schlage Connect stacks up against other digital door locks. 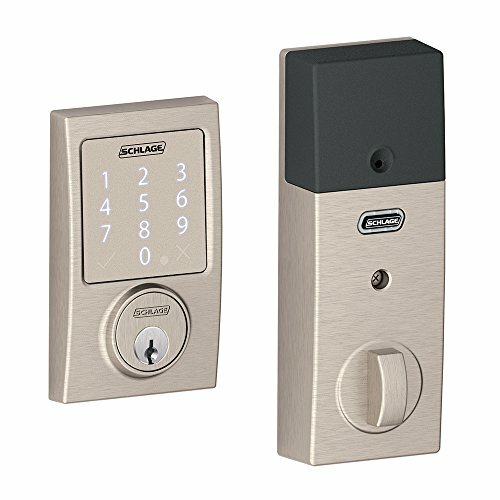 The Schlage Touch door lock is a standard keypad lock but has a couple of security improvements that make it stand out. The keypad is a fingerprint-resistant, LED-illuminated touchscreen, making it nearly impossible for someone to use smudges on the touchscreen to guess the access code. The Schlage Touch also holds up to 19 different access codes, allowing you to give individual access to family members or guests. It does not come with a traditional key, but that makes it 100% secure against lock picking or bumping. 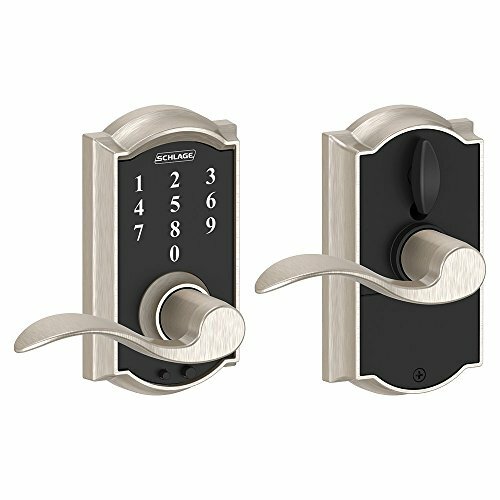 The Schlage Touch comes with a Grade 2 deadbolt replacement, which is not as strong as the Grade 1 of some other Schlage locks but is still highly secure. It’s powered by a single 9V battery with a two-year battery life and has a low-battery light that lets you know when it’s time to change it. There are no alarms or automatic features (in fact, the deadbolt lock has to be manually twisted after an access code is entered), nor any of the smart features of the Sense or Connect. But the Schlage Touch comes with all the security of a Schlage lock with additional security features of a digital lock, which makes it an extra-safe choice. Front dimensions: 3 x 5.4 x 3 in. Back dimensions: 3 x 5.4 x 3 in. Schlage has a range of keypad locks in various styles and finishes, but the basic functionality is the same across the category. Some replace only the deadbolt (BE365 series) while others replace the deadbolt and include a door handle (series FE575 and FE595). Regardless of the style, each lock includes a keypad that can be programmed with up to 19 individual access codes. There is also a traditional key as a backup up method of entry. If you put your lock in vacation mode, the access codes will be temporarily disabled and only the traditional key will work. All of the keypad locks have a Grade 2 security rating. There are two versions of each style of keypad locks that include a door handle: one with autolock and one with flex lock. The autolock feature automatically locks the door after it is opened; the flex lock feature allows you to turn off the autolock by manually changing the position of the deadbolt lever on the inside of the door. We like having the option to turn off the autolock feature, especially if anyone in your home goes inside and out a lot, so we recommend the locks with this feature. The Schlage Keypad locks are high quality and secure, and while they don’t have any smart features or remote access, they add a layer of security to the main entry point of your home. Front dimensions: 3 x 6.8 x 3 in. Back dimensions: 3 x 5 x 3 in. Deciding which Schlage lock is right for your home depends on your home automation setup. If you have an Apple HomeKit home, the Schlage Sense will integrate seamlessly. If you use Amazon Alexa, Samsung SmartThings, or another home automation platform, the Schlage Connect is going to be the right fit. If you simply want an extra-secure door lock, the Schlage Touch or another Schlage keypad lock will be more than adequate. No matter which lock you choose, you can rest easy knowing you will be getting a top-quality, highly secure Schlage lock. Do you use a Schlage door lock in your home? Tell us what you think in the comments below.